Xming is the leading X Window System Server for Microsoft Windows®. It is fully featured, lean, fast, simple to install and because it is standalone native Windows, easily made portable (not needing a machine-specific installation or access to the Windows registry). Xming is totally secure when used with SSH and optionally includes an enhanced Plink SSH client and a portable PuTTY replacement package. Xming installers include executable code, and libraries, only built by Colin Harrison (Project Xming’s chief developer). Mesa with GLX, or Microsoft WGL, provide interactive OpenGL® 2D and 3D network transparent graphics rendering. High performance Windows AIGLX is available for graphics cards that support hardware-accelerated OpenGL. PuTTY is Project Xming’s preferred and integrated X terminal emulator for Microsoft Windows: superseding any requirement for a cumbersome POSIX API compatibility layer and simulated directory mount points. 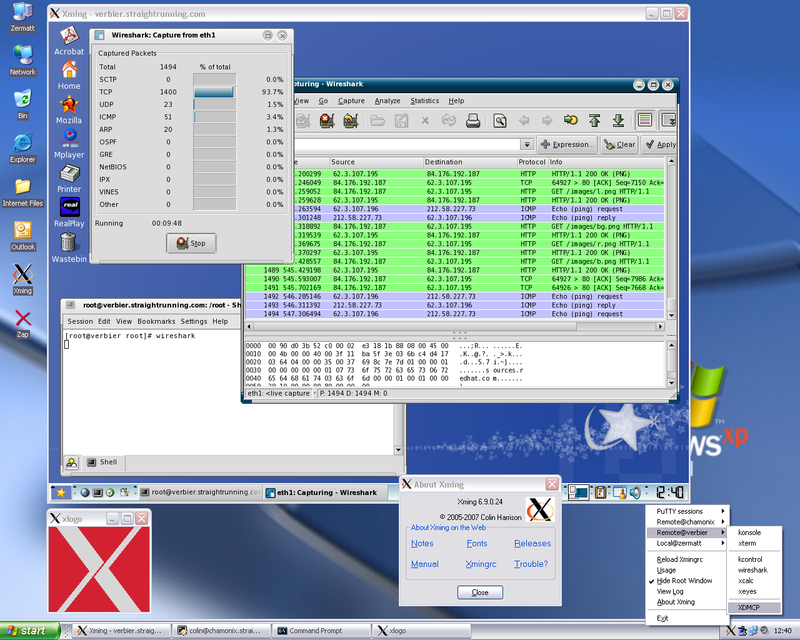 Xming is cross-compiled on Linux for Microsoft Windows, using MinGW-w64, mostly from canonical X.Org source code with my patches applied. It is kept current and secure with frequent updates from X.Org, XCB, XKB, FreeType, Pthreads-Win32, Mesa, PuTTY and Freedesktop Bugzilla. and a few clients on another. See Donations for how to obtain a Donor Password. Xming installers make it child’s play to quickly install project components, interactively, with a few mouse clicks. They also install/uninstall, silently, using command line parameters. Installers are for Windows 10/8/7/Vista/XP (+ Server 2012/2008/2003). Safety note: make sure you put an installer in an empty directory (or in one containing only other Project Xming installer files) before running it. It is also wise to check the MD5 signatures of installers. Optional extras are the Plink for Xming SSH client, XLaunch wizard, Tools and clients and GLX test clients. At least 16.1MB of free disk space is required. The x64 version is specific for 64-bit Windows x64. Note: use 32-bit Xming on Itanium/ia64. Don’t install anywhere other than the default directory unless you really know what you are doing and install using right-click ‘Run as administrator’ if necessary. OpenGL support is now provided by all Xming installers (Xming used to have separate builds and installers; with and without Mesa). If you intend to use PuTTY: make sure you pick the correct Plink SSH client for use with Xming-portablePuTTY or original PuTTY i.e. there are two different Plink(s) in an Xming installer. This additional installer provides standard core X fonts (which are usually required) and optional extended Bitstream Vera replacement fonts from DejaVue. At least 19.8MB of free disk space is required (for the default selection of fonts). 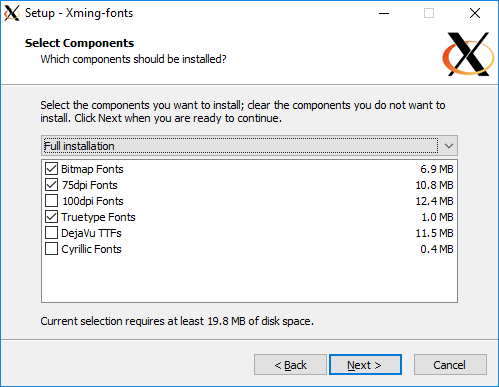 Note: one Xming-fonts installer is common for both 32-bit and 64-bit Xming. I separated these fonts from Xming installers, above, since they have a high installed footprint, don’t change very often and modern X applications use client-side fonts instead via fontconfig. Xming-fonts are however needed by traditional X applications e.g. emacs. Since these standard X Window fonts tend to be ugly, you could use better TrueType fonts from your Microsoft system like this. Instead of installing Xming-fonts, to provide core X fonts, you could use an X font server on your network. This optional installer provides a fully portable replacement for PuTTY. At least 3.9MB of free disk space is required. You should not install portablePuTTY in the same directory you installed Xming: it is completely autonomous. The x64 version is specific for 64-bit Windows x64. Xming-portablePuTTY works without requiring access to the Windows registry. The portable Plink executable incorporates the changes for the Plink for Xming SSH client. Adept operating systems have X11 Network Transparency, why not Microsoft Windows? What can you use Xming for? Extend the magic of X11 Network Transparency to the ubiquitous Microsoft Desktop. Enable your Windows and Linux/Unix machines to integrate as a heterogeneous Private/Personal Cloud by using Xming and PuTTY. Be clear, not cloudy, about where your data is and who may get at it! Use your Microsoft computer as a thin client terminal to remote Linux/Unix machines . Headless a Linux/Unix machine by removing its keyboard, mouse, monitor and maybe even its graphics card. Execute commands via PuTTY terminals, and display via Xming, over your network. Window’s drivers are often faster and more capable than Linux drivers for hardware-accelerated OpenGL enabled graphics cards. 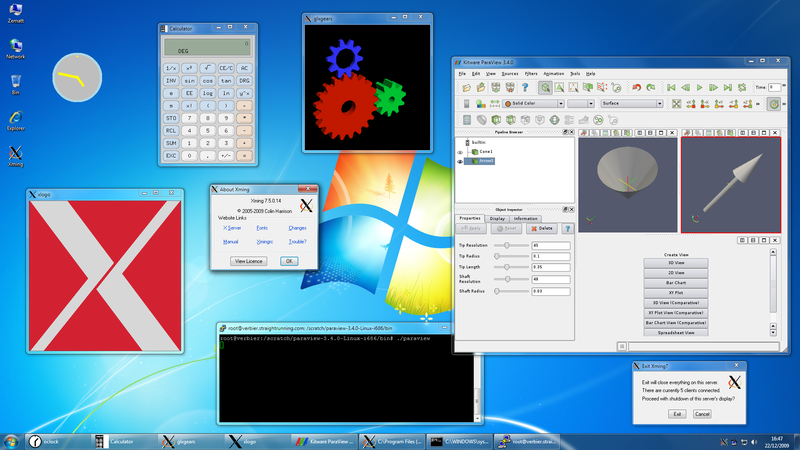 Xming can exploit the capabilities of an OpenGL enabled device, on a Windows machine, by use of its -wgl option in all modes including XDMCP (i.e. -query). 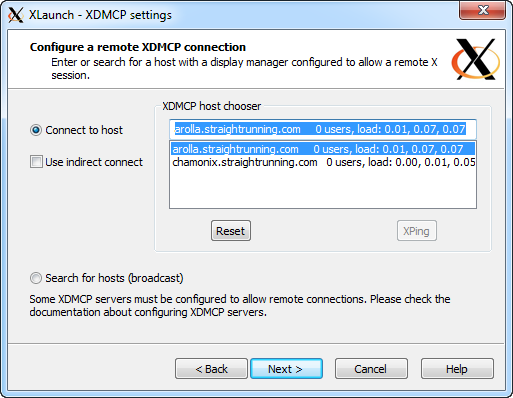 You can display remote X clients directly on the Windows Desktop without running a remote Display Manager and so free up the resources used by that DM. Remote control your Raspberry Pi from Windows. Here is an example XLaunch file to display Midori for Raspbian jessie using Plink. Extend server-side X fonts to include any TrueType fonts on your Windows machine. These high quality fonts can be accessed, in situ, and added to the X server font list. Use Xming with portablePuTTY as a pocket X server by copying both to a USB flash drive etc. Once made portable; no installed software or access to the Windows registry is needed. Old slow redundant Windows machines can be easily re-cycled into slick Linux machines and then accessed with Xming from your latest Windows computer. You will then get the best of both worlds, each with its own separate system architecture, security and philosophy. Xming elegantly and efficiently provides input control and graphical display for software that is running on the remote system. Use SSH and X-Forwarding in -multiwindow mode, instead of VNC, to reclaim precious resources (including desktop space) and facilitate cut-and-paste between windows. This documentation is constantly being updated and may be incorrect for old versions. 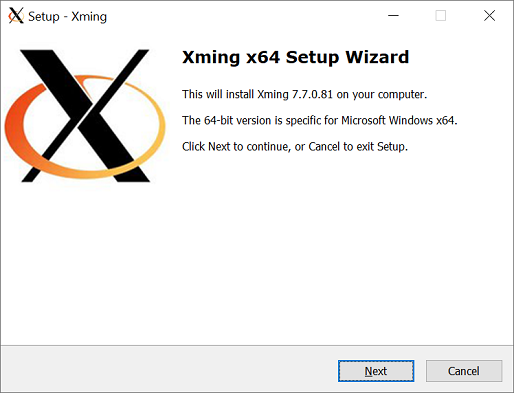 Don’t be put off, there needs to be a lot of it to cover the many uses for the X protocol, but for most users Xming installs quickly and can be started, by the XLaunch wizard, in just a few seconds. Xming Manual. This doesn’t contain any X server commands. 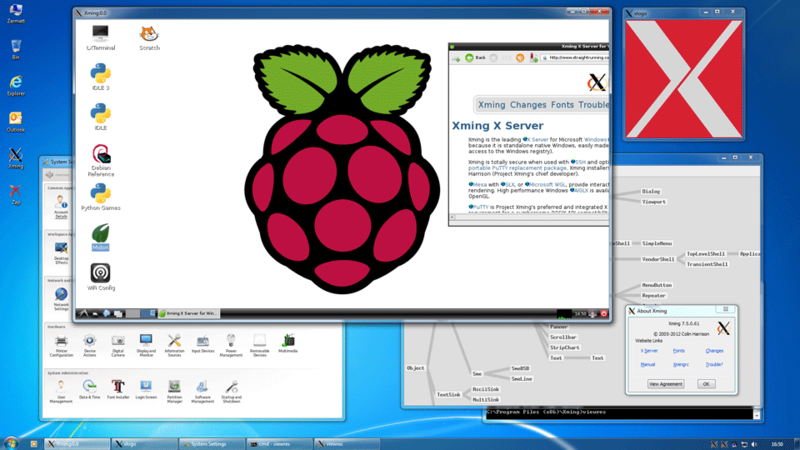 You can view all the applicable X server commands for Xming with -help or run this XLaunch file. These online X.Org Manual pages also give more detail on generic X server and X client options. Note: not all general options are logical for Windows or honoured by Xming. 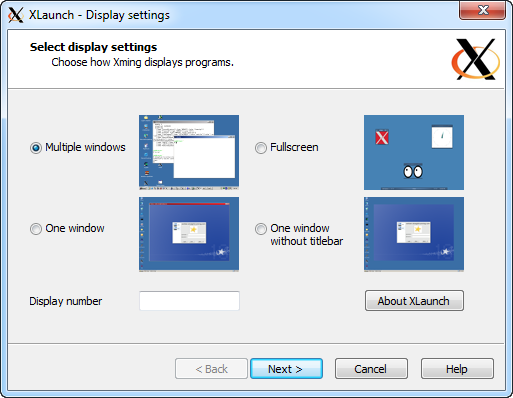 Manuals are also available for XLaunch, Xmingrc, portablePuTTY, PuTTY, Xmon, the Run utility and command line use of Xming’s install and uninstall programs. All Tools and clients also have Xming manuals. I also have a Recipe for setting up a headless Raspberry Pi and remote controlling it with PuTTY and Xming. Use XLaunch -find if all you want is to login to a remote machine and interact with its Display Manager via Microsoft Windows (using XDMCP). This is an elegant way to use an xserver but XDMCP mode is not very secure. It is safer to work via X-Forwarding and the SSH protocol, e.g. using PuTTY, on shared networks. Getting started with PuTTY X-Forwarding is described below and in more detail here. A good tip: get PuTTY working first with Pageant, and use Saved Sessions, before using Xming/Xmingrc/XLaunch. Those Saved Sessions should only use the SSH-2 protocol, ‘Enable X11 forwarding’ and for the following example set ‘X display location’ to ‘localhost:0’. If you now need a Command Prompt: run it from Xming's notification area icon menu. You cannot run two X servers with the same display-number; use the :display-number option if you want multiple instances. On recent Windows versions: in order to easily use Xming’s notification area icon(s) you should set ‘Show icon and notifications’, for the Xming X server icon. >plink -load <session-name> firefox               or, with a PuTTY Saved Session name. 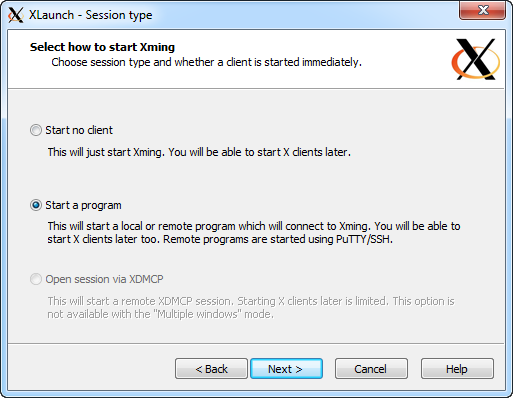 XLaunch is a wizard for simplifying the startup of an Xming X server. Its re-usable XML configuration files also act as mini-session managers. One X client can be selected for concurrent display from a local or remote machine. When remote, the X client is accessed securely via PuTTY or SSH. Also use XLaunch to just simply start the X server and then run several X clients later by hand, or from Xmingrc menu entries. 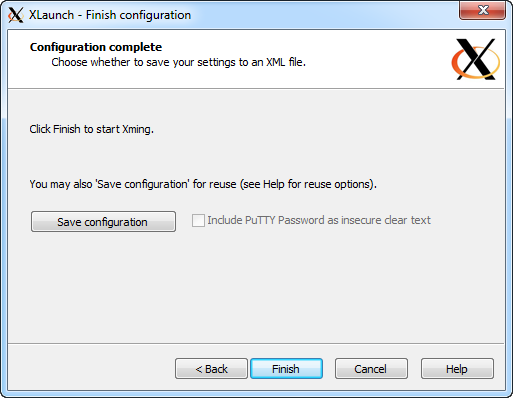 Example .xlaunch configuration files for a remote xterm via PuTTY and a remote login via XDMCP. You can select the windowing mode, the way sessions are started and save the configuration for later reuse. An XLaunch configuration file can be just clicked to rerun saved settings without having to go through the wizard pages. Also automatic validation of configuration files against the XLaunch XML Schema Definition is selectable when starting the wizard. Additionally, automatic display-number (i.e. X server) allocation is provided. You can configure the X toolbar icon menu (i.e. the right-click menu on Xming’s notification area icon), Windows icons, styles and system menus (i.e. 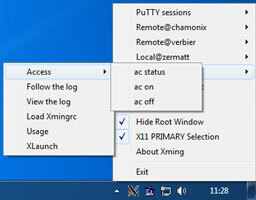 the right-click menu on a Window’s title bar) using an Xmingrc file. Additionally, on the icon menu, a Host Finder is provided for listing, choosing and then accessing any responding XDMCP hosts on your network, as well as a log file viewer. It is also possible to not hide the root window (Note: you may lose control of your desktop it you don’t ‘Hide Root Window’) and disable the ‘X11 PRIMARY Selection’ (the highlighted text copying mechanism with X clients). I use this Xmingrc file to open X Window clients (singly or combined in session files), PuTTY and Command Prompt terminals, and to control access to the X server. Remote Linux/Unix (and local Windows) programs can be run from Xmingrc menu items. Use of Plink is recommended when starting remote programs. Xmingrc is a structured text file, so to avoid errors, study the installed default Xmingrc file (plus my Xmingrc file: see screenshots below). Use the links in the table above to view Xming manuals for each entry. Note: xkbcomp is built without a Windows console (Windows GUI), and always installed, as it is used by Xming during X server startup. Also Xmon is sourced here not from X.Org. xroot is a CUI tool providing a clickable swatch of root window for use when -rootless to access window manager root menus which otherwise maybe hidden. follow is a simple CUI Windows text following tool, like Linux/Unix ‘tail -f’, for monitoring Xming log files. font-dirs is a tool used by an Xming installer to create a custom font-dirs file. The executable itself is not installed. glxgears and glxinfo (+ seventeen more GLX clients from the canonical Mesa Demos) are available separately via installer component ‘GLX test clients’. >xkbcomp -a :0 %TEMP%/desc.xkb                     Output the keyboard source, including comments. >xkill -frame                                      Use in -multiwindow mode to select a client to close. >xroot -geometry 50x50+500+50 -color SteelBlue     Useful with -rootless and some window managers. for display 1 clients, while an X server is running display 0. Plink is a command line connection tool, similar to Linux/Unix ssh, that is used for automating secure remote operations from XLaunch and Xmingrc. The Xming Plink SSH client is made with MinGW-w64 from patched PuTTY code. These modifications substitute Windows prompts for many console ones because XLaunch and Xming are built console free (GUI) and so stdout/stderr messages are hidden when Plink is spawned from them. Use as a replacement for Plink in ‘standard’ PuTTY (i.e. installers or binaries downloaded from Simon Tatham’s website). 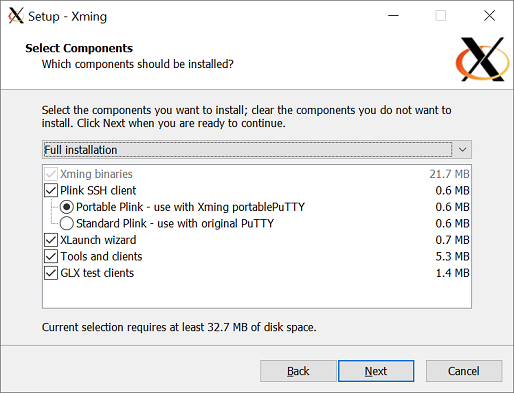 Note: Xming-portablePuTTY’s Plink incorporates the same changes but is not compatible with ‘standard’ PuTTY (there is a choice of two different Plink(s) in an Xming installer). An example using Plink in a .js file to display a remote xterm. The Run utility is an autonomous tool used to start Windows applications with a hidden attached console command window. This is the Manual for run. Its 32-bit binary, 64-bit binary and source code are supplied separately from Project Xming; and licensed GPLv2. Here is an example Desktop Shortcut using run and Plink to display a remote konsole. Note: PayPal’s site needs cookies enabled and these Ts&Cs apply. By donating you will get a Donor Password sent by email, enabling access to Xming Website Releases and Development Snapshots for private individuals. This will be sent to the email address in the PayPal payment history; so please make sure it works and that you are not blocking my ISP’s mailservers ( zen.co.uk e.g. smarthost01.mail.zen.net.uk). If you have contributed in other ways (e.g. code or patches), or not received your password: contact me. Also if you can’t use PayPal, again contact me by email (colin<at>xming<dot>myzen<dot>co<dot>uk) for alternatives. The suggested PayPal donation is £10 since less has a high percentage loss due to transfer charges. Note: You don’t need a PayPal account to use PayPal from the button above, but the link does need cookies enabled. I greatly appreciate contributions towards improving Xming’s development and hosting resources. Plus, if you found Xming useful, a little thanks gives me the motivation to make it even better. Many Enhancements, Changes and Bugfixes not in the Public Domain Release. The latest Website Releases and regularly updated Development Snapshots. Modular executables and libraries from X.Org ≥ X11R7.7 plus latest keyboard and locale databases. Extra Windows X clients including GLX demonstrators and Xmon. Support for dual-stack IP hosts (IPv4 and IPv6). OpenGL enabled rendering via either Mesa or Microsoft WGL (option -wgl provides hardware-accelerated OpenGL for graphics cards that support it in all modes including XDMCP i.e. -query). XCB ported to Windows without the performance degradation of a Linux API translation layer. 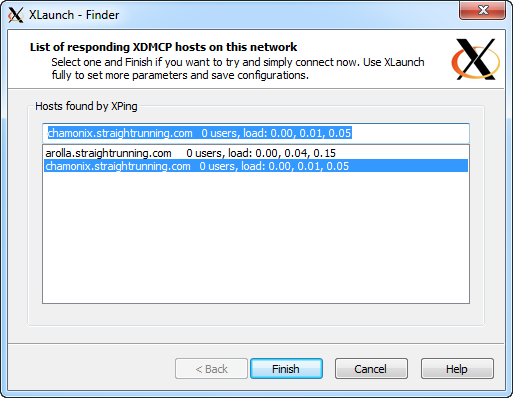 The XPing XDMCP host finder/chooser integrated into XLaunch also with quick and simple activation from Xmingrc. Native 64-bit code installers for Windows x64 (including 64-bit PuTTY). I have actively contributed to the X.Org Foundation’s open source implementation of the X Window System for many years. Other projects also benefit from Xming developments. These are freely available for their use when correctly cited in accordance with conditions. I get so much email that I literally do not have time to answer it all. I regret this, but there’s nothing I can do about it. So if you can possibly avoid sending mail to me, I recommend you do so. In particular, support requests are probably better sent to newsgroups, or passed to a local expert if possible. Reports will ALWAYS be ignored by me if your complete Xming log file is not attached, if the report lacks detail and clarity and if you compare Xming with an X server not built directly from X.Org code. If a Plink problem I need the Plink command line used or a copy of your config.xlaunch file and if an Xmingrc problem I need a copy of your Xmingrc file! Tell me, upfront, if you are using virtual machine interfaces between Windows and Linux/Unix installed on the same machine. Failing to follow instructions, or answer questions, will quickly lose any interest in your problem. I do however appreciate well formulated reports and suggestions; but read this website’s documentation first before asking a question…I don’t reply if the answer is already here. This URL links to the Project Xming’s Ts&Cs including details on copyright, licensing and purchases with many clarifications. Ts&Cs may change from time to time. It remains your responsibility to check them whenever you access this website or download, install and use any Project Xming software.